This book addresses the paradox of political mobilization and the failings of governance in India, with reference to the conflict between secularism and Hindu nationalism, authoritarianism and democracy. It demonstrates how the Internal Emergency of 1975 led to increased support of groups such as the BJS and the RSS, accounting for the rise of political movements advocating Hindu nationalism - Hindutva - as a response to rapid political mobilization triggered by the Emergency, and an attempt by political elites to control this to their advantage. 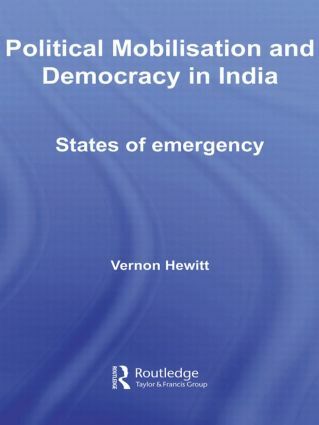 Vernon Hewitt argues that the political disjuncture between democracy and mobilization in India is partly a function of the Indian state, the nature of a caste-class based society, but also - and significantly - the contingencies of individual leaders and the styles of rule. He shows how, in the wake of the Emergency, the BJP and the RSS gained popularity and power amid the on-going decline and fragmentation of the Congress, whilst, at the same time, Hindu nationalism appeared to be of such importance that Congress began aligning themselves with the Hindu right for electoral gains. The volume suggests that, in the light of these developments, the rise of the BJP should not be considered as remarkable – or as transformative – as was at first imagined. State–society relations 1947–1950: a democratic polity?